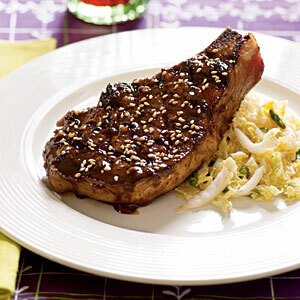 Spicy sweet pork chops will get rave reviews. 1. Combine first 8 ingredients in a zip-top plastic bag; add pork to bag. Seal; marinate at room temperature 25 minutes. 2. Heat a grill pan over medium-high heat. Coat pan with cooking spray. Remove pork from bag; reserve marinade. Sprinkle pork with salt. Cook pork 3 minutes on each side or until done. Pour reserved marinade into a small saucepan; bring to a boil. Reduce heat, and simmer 2 minutes or until thickened. Brush pork with reduced marinade; sprinkle with sesame seeds.